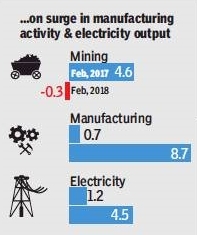 Retail inflation eased to a five-month low in March on the back of cooling food prices, while industrial output growth remained robust in February, signalling a recovery. Inflation, as measured by the consumer price index, rose an annual 4.3% in March, which was slower than previous month’s 4.4%. Inflation in the rural areas was 4.4%, while in urban areas it was 4.1%. The food price index slowed to 2.8% in March from February’s 3.3% as vegetable prices cooled. 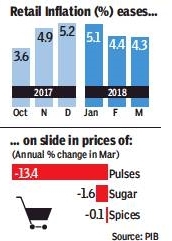 Prices of pulses contracted 13.4% during the month as well as sugar and confectionary by 1.6%.